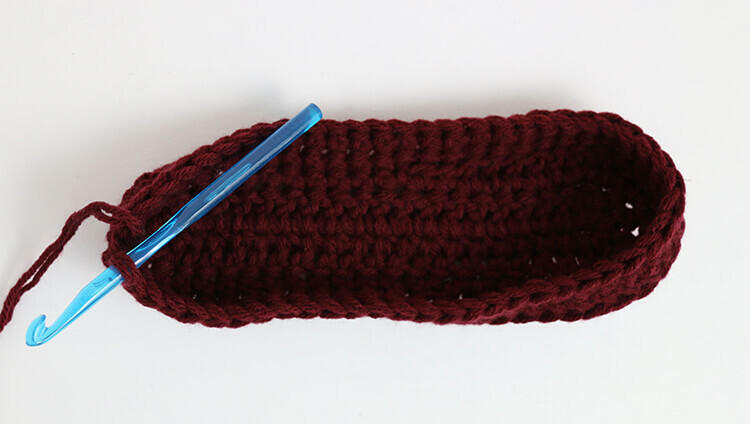 Learn how to crochet slippers with this simple free pattern with step-by-step photos. 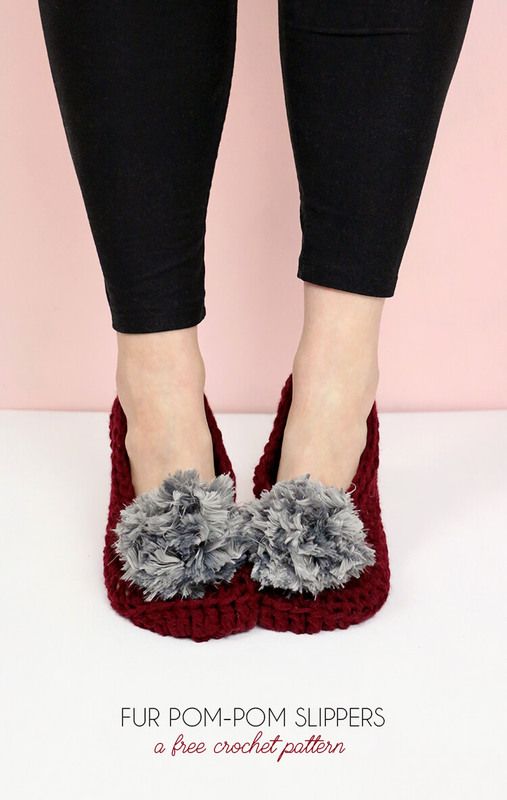 These Fur Pom-Pom Slippers are easy to make and their trendy faux fur pom-pom make them extra stylish. This project was originally shared at Crafts Unleashed and contains affiliate links, which help to support this site. Thank you! Anyone else suffer from cold-toe-itis? That’s obviously a completely made up malady à la Doc McStuffins, but seriously, guys, my toes are always freezing! I know I’m not the only one. 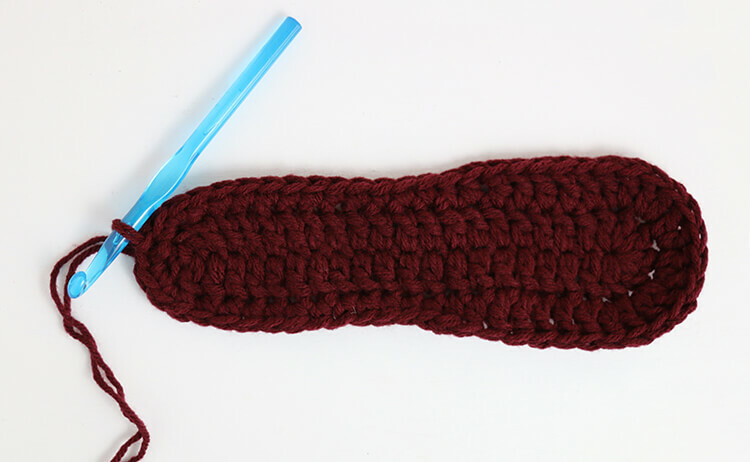 If you have icicle toes like me, then I’ve got a fun little free crochet pattern for you today that can help you warm up those tootsies in style. 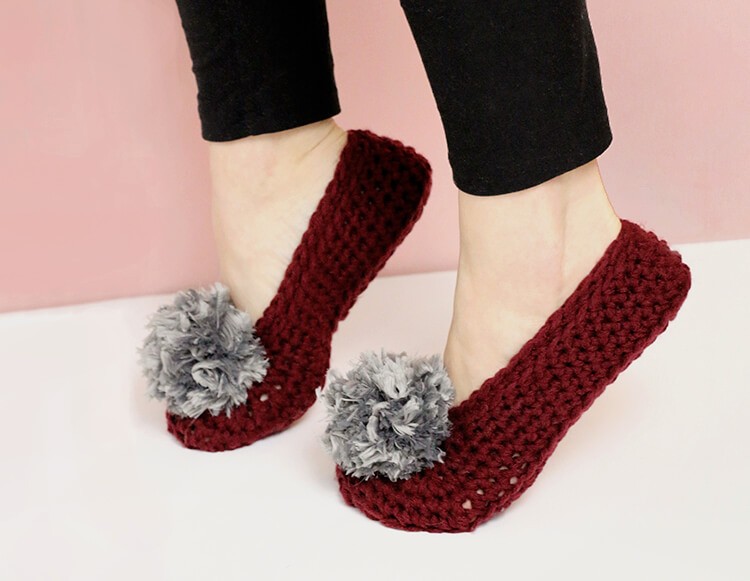 Faux fur accents and accessories have definitely been popping up all over runways and fashion magazines lately, and these simple crochet slippers are a fun and easy way to try out that trend. 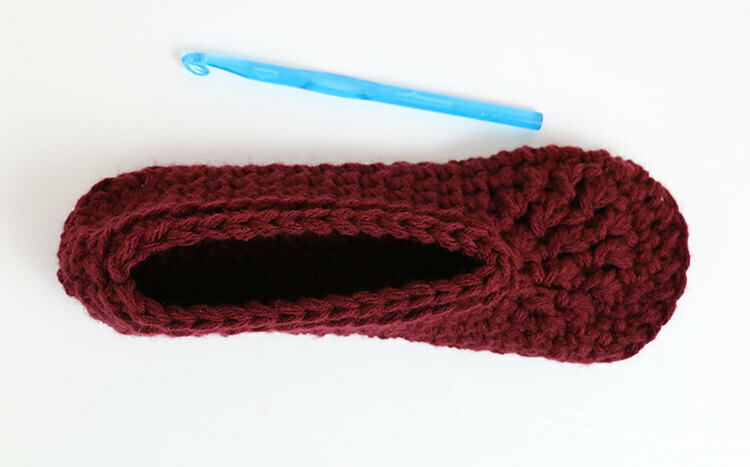 Ready to learn how to crochet slippers? 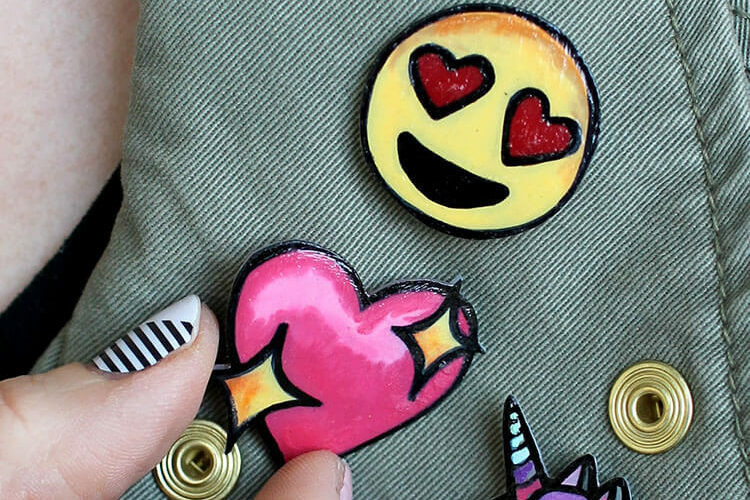 If you haven’t made any in the past, don’t worry – I’ve got you covered with a super simple pattern and step-by-step photos. Let’s do this! Please Note: This pattern is free for personal use. You may sell items that you make from the pattern as long as you include a link back to the pattern when possible. Please do not sell or redistribute the pattern in anyway. If you want to share the pattern with a friend, please just send them a link. Thank you for your support! 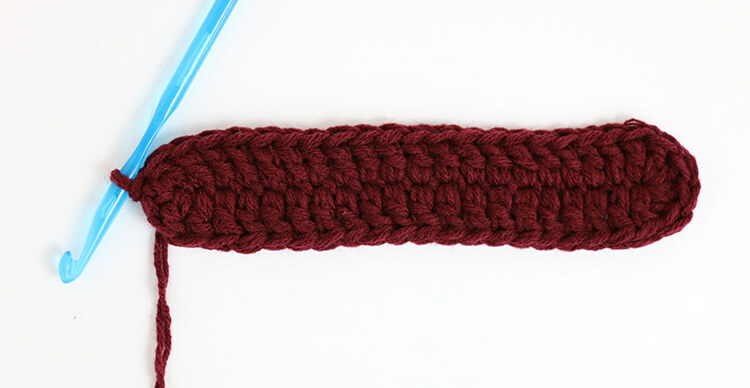 Double Crochet Three Together (dc3tog) – Yarn over, insert hook into stitch and draw up loop (3 loops on hook). Insert hook into next stitch and draw up loop (4 loops on hook). Insert hook into next stitch and draw up loop (5 loops on hook). Yarn over and draw loop through first 4 loops (2 loops on hook). Yarn over and and draw loop through remaining 2 loops. This pattern includes instructions for two sizes – Small and Large. Size Small should be about 9 inches (23 cm) long when finished, and size Large about 10 inches (25.5 cm) long. Keep in mind that they will stretch out quite a bit worn. Instructions for size Large will be shown in bold parentheses. For example, “ch 10 (12)” means to work 10 chain stitches for size Small and 12 for size Large. in next 2 sts, sl st to join. 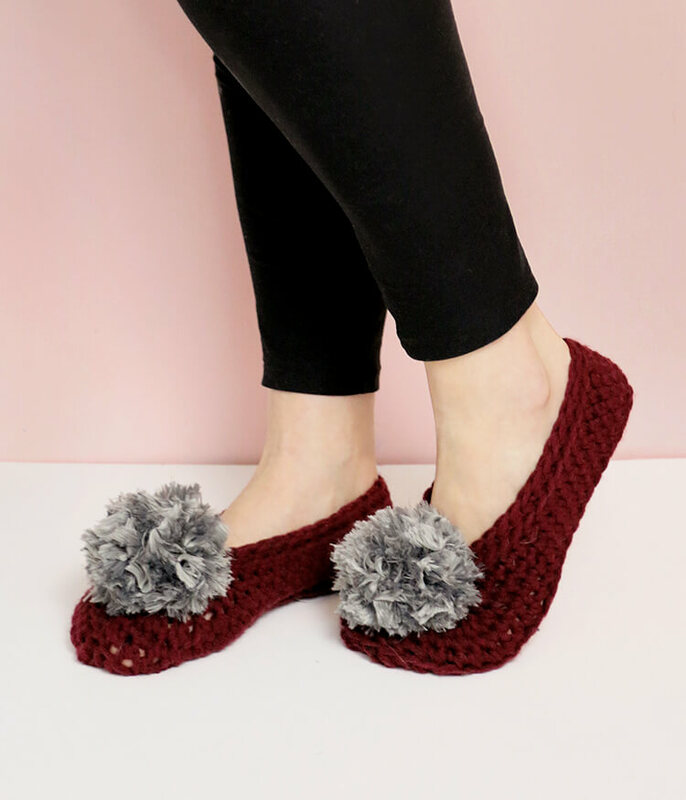 At this point, you have a pair of simple crochet slippers that you could just wear as is, but what makes these slippers special, is the fur pom-pom! So let’s fancy our crochet slippers up a bit, shall we? 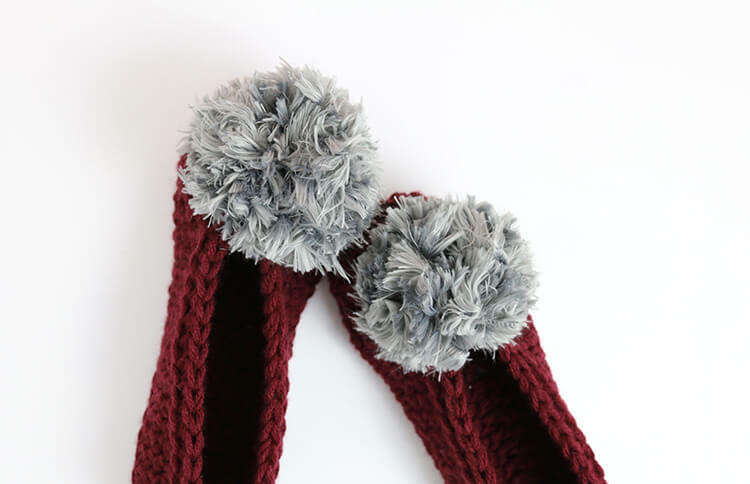 Fur yarn is the secret to getting these super cute and fluffy pom-poms. I really love the way these cuties turned out, but I do need to warn you that making them is definitely a bit messy. Keep your lint roller handy! 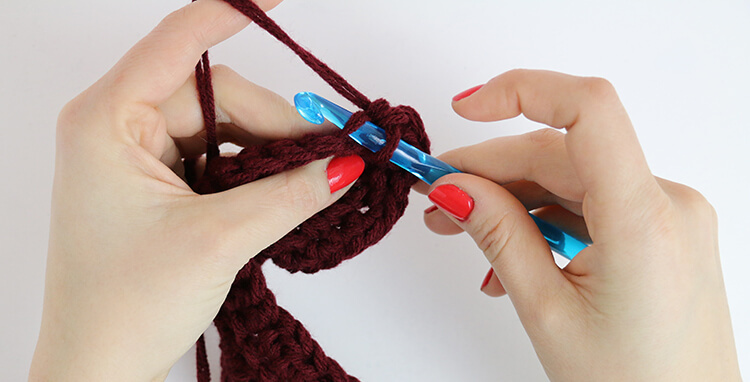 Start by wrapping the fur yarn around your fingers. Keep wrapping until the stack of loops are about as full as you want the finished pom pom to be. 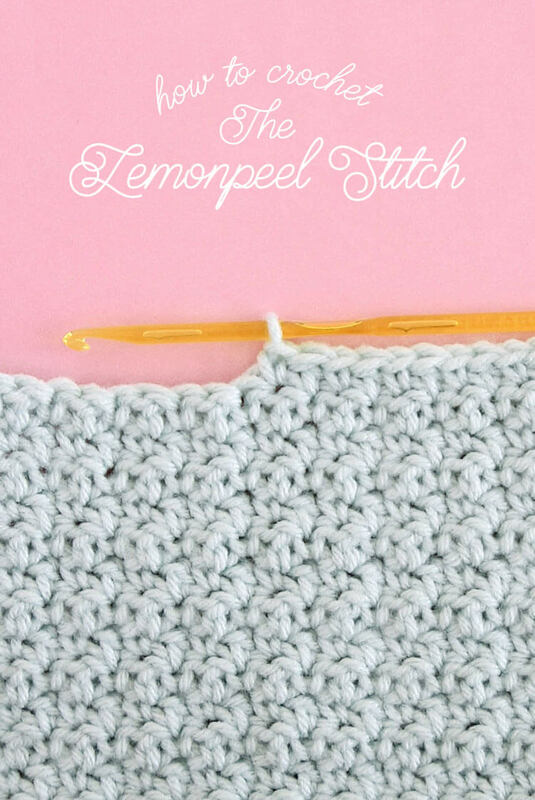 Pull a 12″ piece of your plain worsted weight yarn around the middle of the loops, and tie tightly with a double knot. Slide the fur loops off your fingers and cut through the loops on both sides. 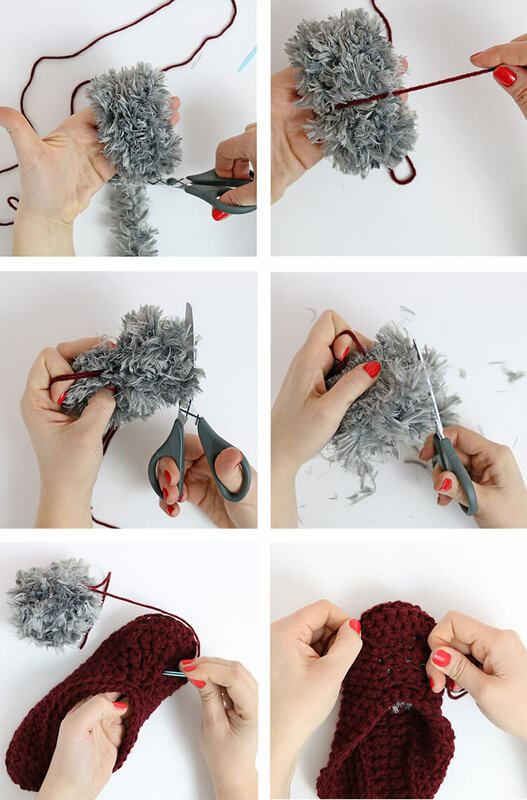 At this point you have a messy pom pom with two long yarn strings. 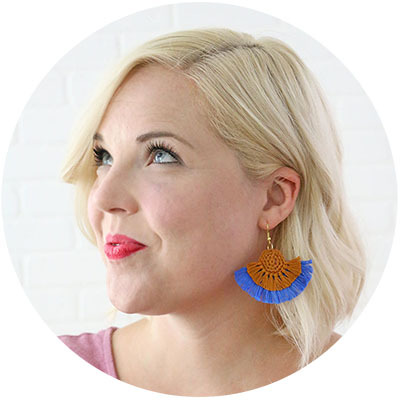 Shape up your pom pom by snipping off longer strands. Keep trimming until it has a nice round shape. 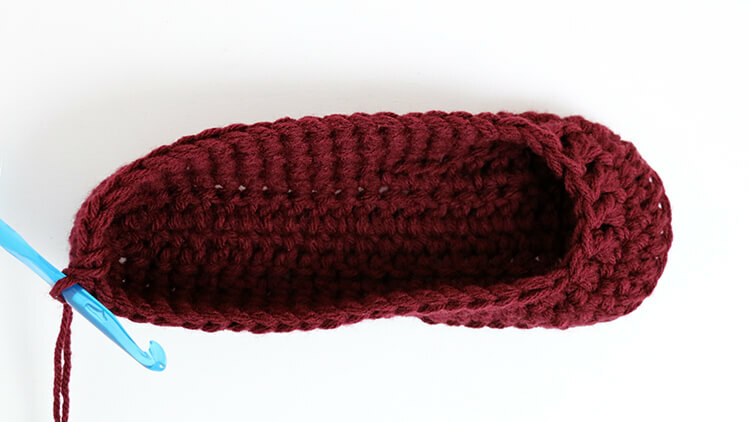 Using a yarn needle, pull your pom pom’s worsted weight yarn tails through the front of the slipper to the inside. 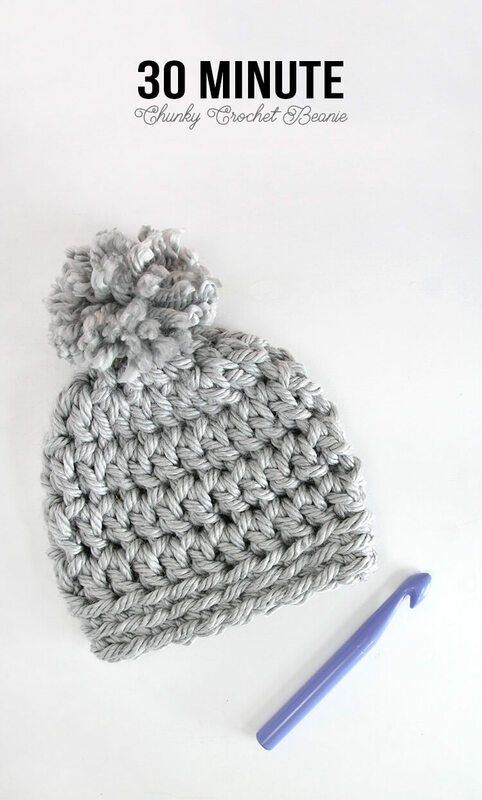 Finally, secure the pom pom in place with a double knot, and weave in the worsted weight yarn ends using your yarn needle. And that’s it! 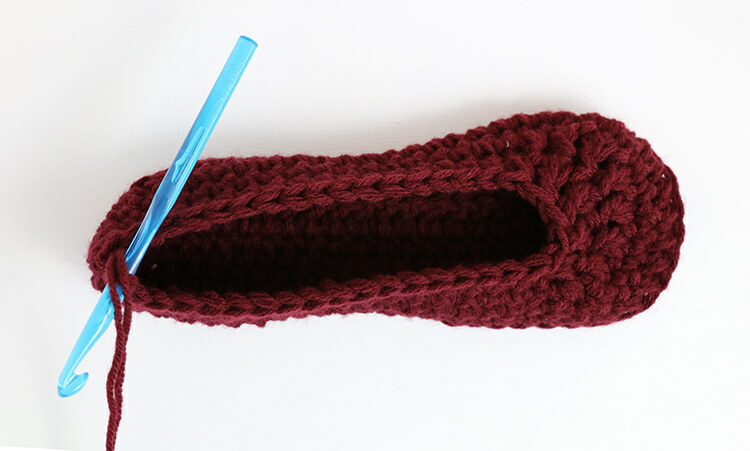 Your new crochet slippers are finished and ready to keep your toes nice and warm through this cold winter! 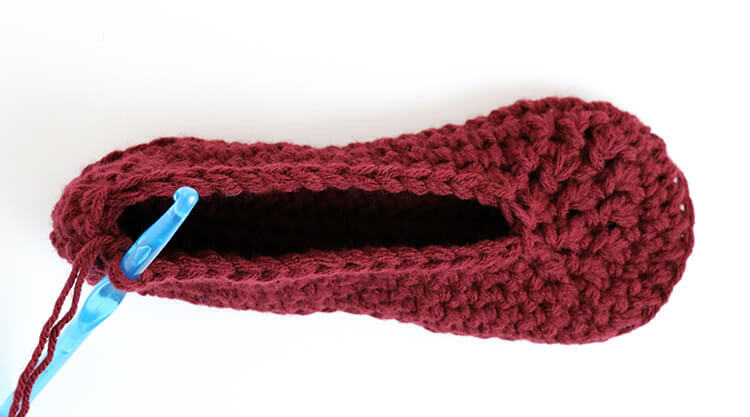 If you make your own crochet slippers using this pattern, I would LOVE to see them. 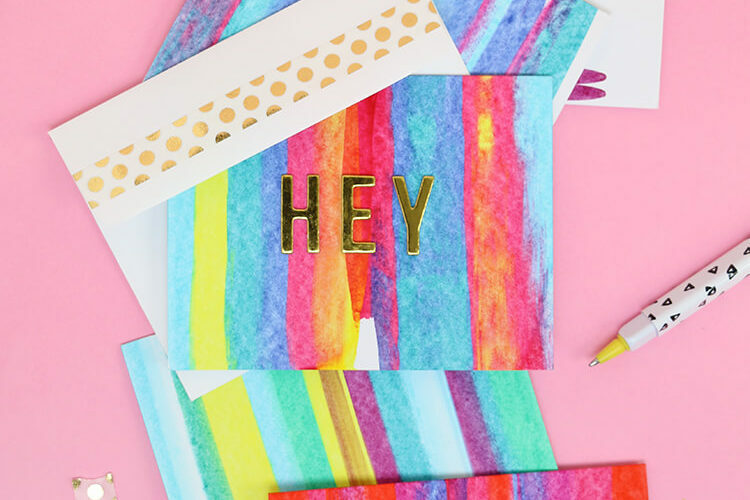 Seeing you guys use my patterns is pretty much my favorite part about this whole blogging gig. You can share your photos to my facebook page or tag me on instagram or twitter (@persialou). These look fantastic! 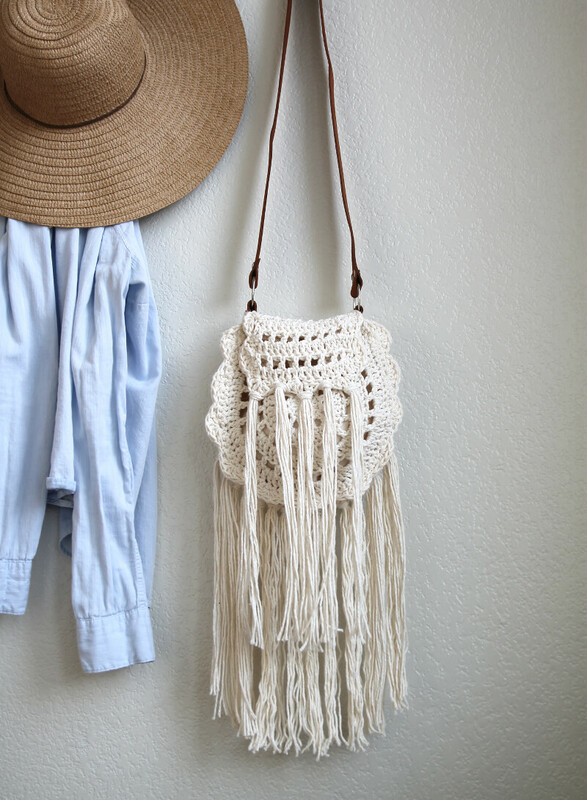 What a clever way to make this pom pom! Thanks so much, Maria! I was really happy with the way the fur pom pom turned out. 🙂 Have a great day! Thanks for always sharing cute projects. I still use my slouchy beanie that I made from your pattern and I LOVE it! Hi Chrissy! Thanks so much! And yes, NEVER to early to starting planning Christmas! Would love to make these for my sister and I but work better off of seeing a video!! Thank you for this wonderful pattern! I am dyslexic & struggle with written patterns. You wrote it in a way that was easy to understand. I have paid for several slipper patterns and this is the only slipper pattern that works for me. Bonus, it was free! I am on my third pair now. Great design great instructions. Bravo! I am a little confused by the number of chains in the beginning of the recipe – when I chain 22 and after that chain 3 more and chrochet a dc in the 22nd chain – after that chrochet 19 from the 21st chain “backwards” – it leaves me with 2 chains to chrochet the 6 dc in the same chain???? Do I just begin with 21 chains and then follow the recipe? I like the slippers you have made and I want to make them too :-). You’re right Ane! Happens the same to me doing the small size, the starting chain must be one chain less! Come on!! We get it dear ?????? I love all your patterns, love love this one. I have seen many patterns with two strands of a smaller weight yarn together and wondering if you use something chunkier or bulkier that would be similar would you get the same results? Or is there a particular reason to use two strands – like it is better for a slipper? Can anyone tell me what size foot (shoe size) these slippers fit. I want to make them for a friend who wears size 7.5 shoes. Would the slippers with a 20 chain starting chain fit 7.5?